Boeing is temporarily cutting production of its best-selling 737 airliner in the continuing fall-out from crashes in Ethiopia and Indonesia. Production will drop from 52 planes a month to 42 from mid-April, Boeing has said in a statement. The decision is a response to a halt in deliveries of the 737 Max – the model involved in the two accidents. A report from the Ethiopian authorities issued on Thursday said the pilots of flight ET302 “repeatedly” followed procedures recommended by Boeing before the crash. What did the Boeing statement say? “We now know that the recent Lion Air Flight 610 and Ethiopian Airlines Flight 302 accidents were caused by a chain of events, with a common chain link being erroneous activation of the aircraft’s MCAS function. We have the responsibility to eliminate this risk, and we know how to do it,” the statement from Chief Executive Officer Dennis Muilenburg said. “As we continue to work through these steps, we’re adjusting the 737 production system temporarily to accommodate the pause in Max deliveries, allowing us to prioritise additional resources to focus on software certification and returning the Max to flight,” he said. Current employment levels would be maintained, the statement said, and a new committee is being set up to look at “policies and processes for the design and development of the airplanes we build”. What difficulties has Boeing faced? The 10 March crash of Ethiopian Airlines ET302 led to airlines round the world grounding their 737 Max aircraft. 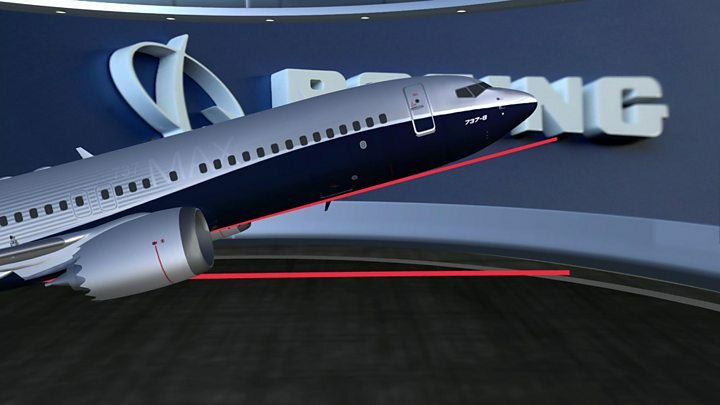 The US Federal Aviation Administration (FAA) was one of the last major regulators to order the grounding of the Max, leading some to accuse it of being too close to Boeing. Questions are being asked about why the planes were not grounded earlier. Deliveries of the Max were halted, leading to an excess of the planes needing storage. After the statement, Boeing shares fell just over 1% in after-hours trading to $ 387.14 (£333). Boeing apologised on Thursday saying it was “sorry for the lives lost” in both accidents. But this has failed to satisfy many relatives who questioned why Boeing did not act earlier to take the planes out of service. The chief pilot’s father, Dr Getachew Tessema, told the BBC the apology was “too little, too late”. Yared Getachew, 29, had more than 8,000 hours of flying experience when he was killed. “I am very proud about my son and the other pilot, both of them,” he told the BBC’s Emmanuel Igunza. “To the last minute they struggled as much as they could but unfortunately they were not able to stop it. Dr Tessema levels the blame squarely at Boeing, questioning why the company did not stop the 737 Max flying after the Indonesia crash. Relatives of an American passenger who died in the Ethiopian crash, 24-year-old Samya Stumo, filed the first lawsuit against Boeing on Thursday in Chicago.